In this post, I explain the difference between the client.svc and the listdata.svc both services provided by SharePoint. In this article I mention the fact that the ADO.NET Data Services can retreive only 1000 items at a time and somebody asked me some informations about this limitation. 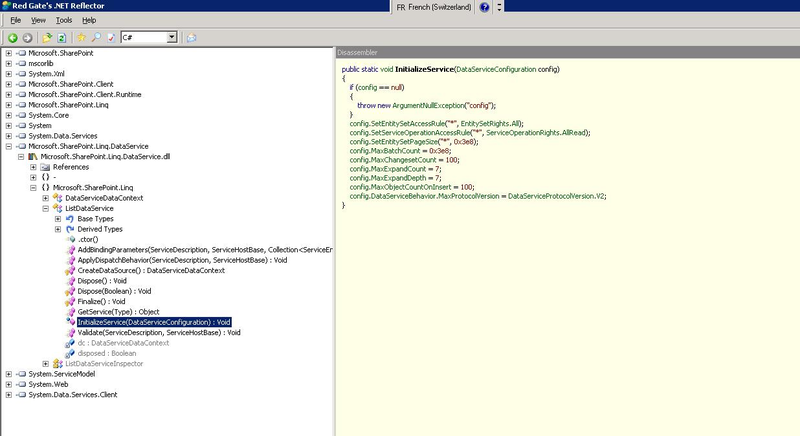 Well after some investigations I have found out that it comes from the configuration of the listdata.svc on the SharePoint. Here is what I did. and … I found an interesting line. Ok we can retreive only 1000 items by page but we can go through the “pages” to get all the items. For this we will use the DataServiceQueryContinuation which will be used as token that we will pass to the query to get the next results page. If you have any question on the code, please feel free to comment this article. Before comparing performances between ADO.NET Data Services and the Client Object Model Service, we will go through a small review on both technologies. 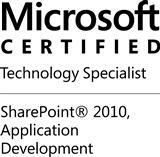 The best news for the SharePoint developer it’s that ADO.NET Services is now part of the SharePoint Platform. All what you need to do is to install this. Once ADO.NET Data Services installed on your SharePoint, you will get a new WCF in the _vti_bin virtual directory of SharePoint: listdata.svc. Note that the _vti_bin directory points to the %ProgramFiles%/Common Files/Microsoft Shared/Web Server Extensions/14/ISAPI folder. If you query this Web Service with your favourite browser (i.e. http://<sharepointUrl>/_vti_bin/listdata.svc), you will see a listing of all the lists of the SharePoint Site written in a standard Data Services Atom Feed. If you create a custom list, it will also appear there. To use the capabilities of this new feature, you just simply need to reference it in your .NET project as you would do with a standard WCF. The Client Object Model is used through the Client.svc WCF Service published into the virtual directory _vti_bin (%ProgramFiles%/Common Files/Microsoft Shared/Web Server Extensions/14/ISAPI). I’ve made a small performance test to compare ADO.NET Data Services and the Client Object Model. 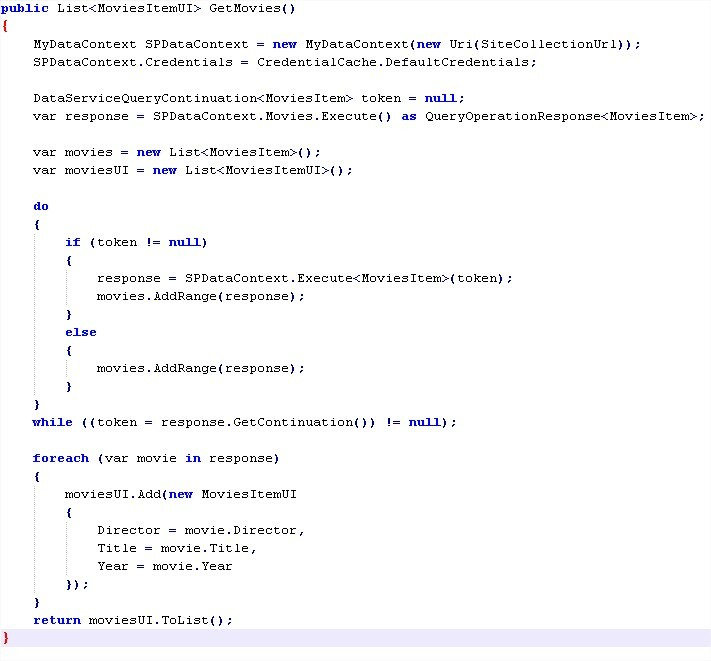 I created a custom list called movies and query the list using ADO.NET Data Services and Client Object Model 20 times. Note that the RowLimit is set to 1000, indeed ADO.NET Data Services can not retrieve more than 1000 item at a time so I set the limit at 1000 items also for the Client Object Model request to run a benchmark on the same number of items. The results I found speak for themselves. 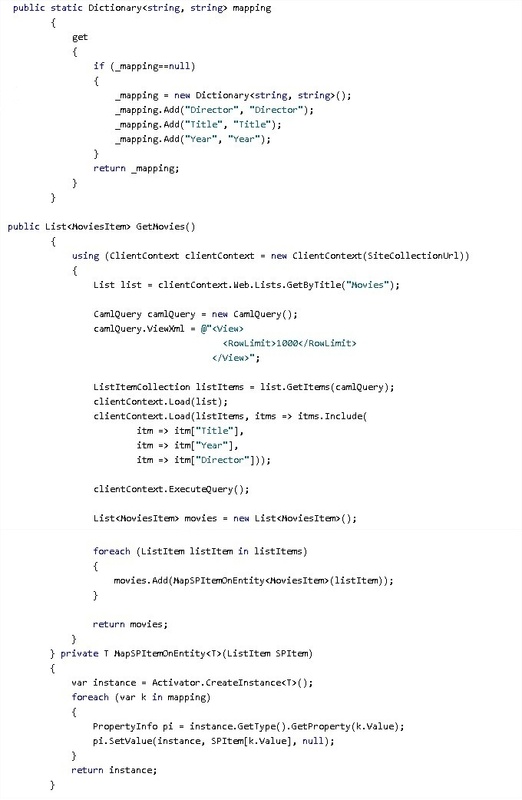 The Client Object Model is slightly faster than the ADO.NET Data Services.